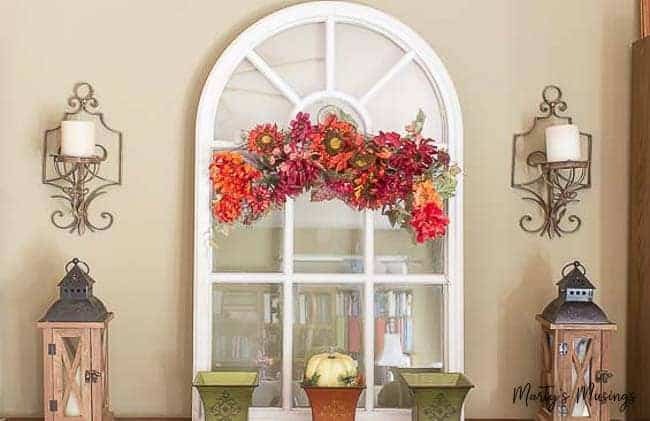 Great ideas for ways to save money on fall decorating, including tips on buying from thrift stores, using natural elements and shopping your own home! 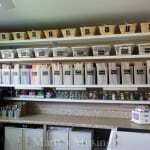 Have you ever wondered why people spend tons of money decorating their homes for every season and holiday of the year? I have to confess when I started sharing my home on the blog here a few years ago I got caught up in the whirlwind of social media and pretty Pinterest projects, chasing perfection and the latest and greatest home decor styles. 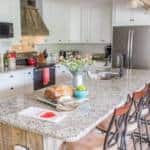 By signing up to share my home tour with lots of well known bloggers I was hoping to gain new readers who would come see my pretty little house. At the same time I was shoving the ugly “real life stuff” that didn’t make the photo cut into tubs and moving from room to room, sweating and complaining. I didn’t love my home on those days. I was critical, looking through the lens of comparison, always falling short. The joy of my home was lost as well as the blessing of the life God had given me. You probably never even notice I don’t do home tours anymore. Truth is the stress of dragging fall decorations out in August just doesn’t appeal to me at this stage of my life. But here’s the kicker: I don’t even get asked to participate. The beauty of owning my own business is my journey doesn’t have to look like everyone else’s. 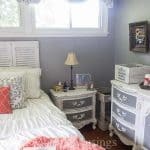 My heart’s desire is to help YOU, my favorite people who graciously read this blog, love YOUR home and find contentment there. When I write about my struggles to find time to decorate, learn to be creative and squeeze money out of the budget, I’m just being transparent! 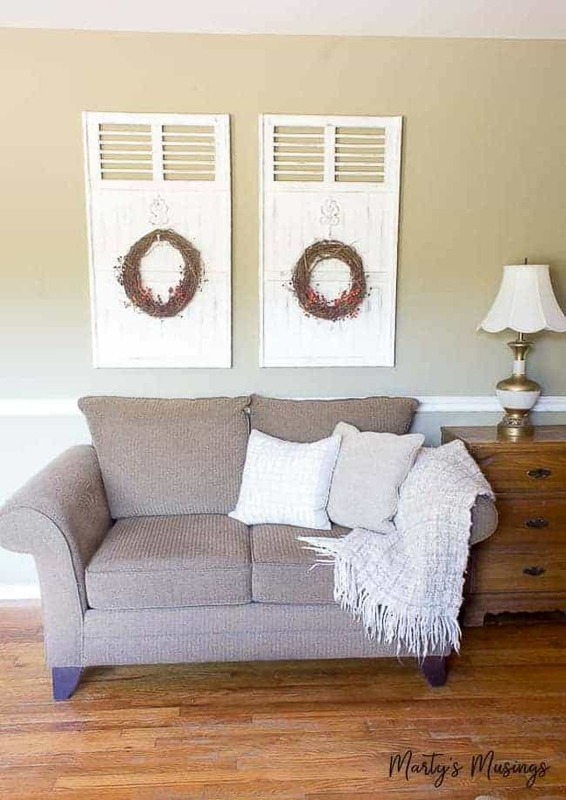 So instead of some perfectly staged new photos I went back through all my fall posts to find the most inexpensive fall home decor ideas for both of us to use this year. 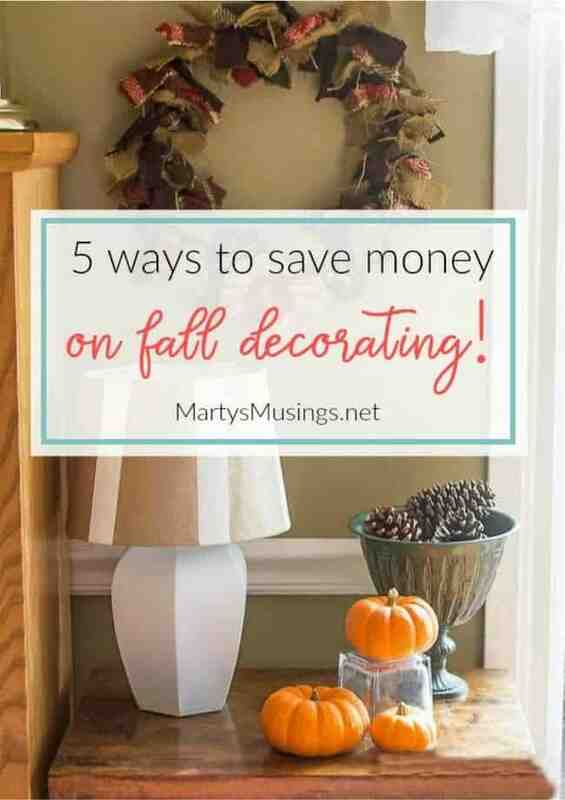 Here are my best easy tips to save money on fall decorating which don’t require you to totally throw out what you have and redecorate your home from scratch! I store my out of season home decor in the attic but sometimes all it takes is a walk around my house to repurpose some goodies for the next season. 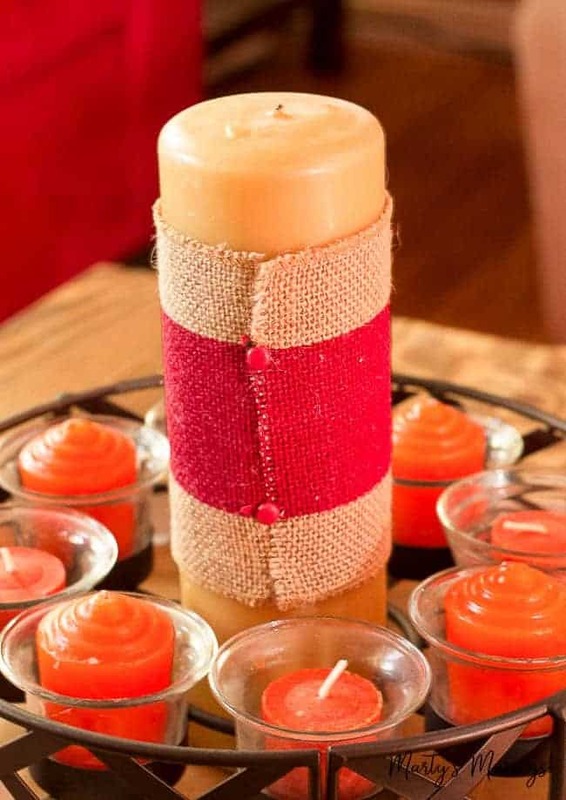 These white candle holders have been used to hold everything from burlap wrapped candles, Valentine decorations to candles at my daughter’s wedding. 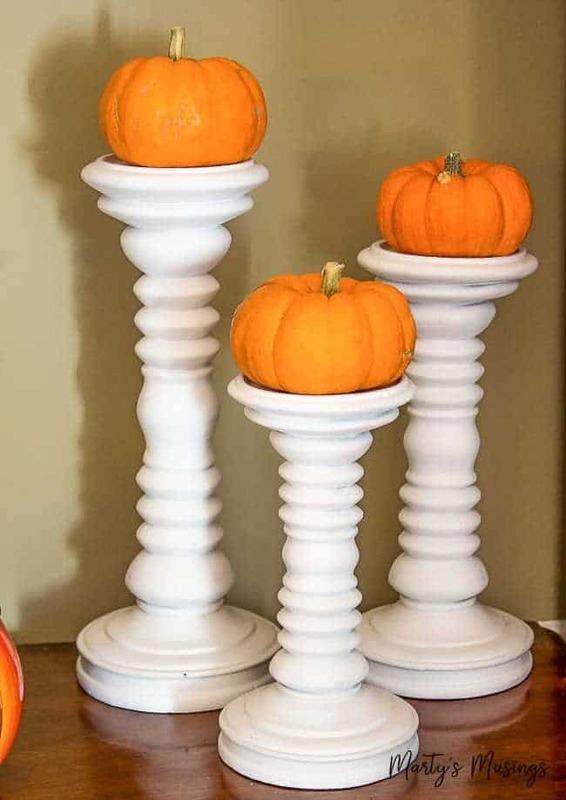 What could be simpler than mini pumpkins for these spray painted holders? 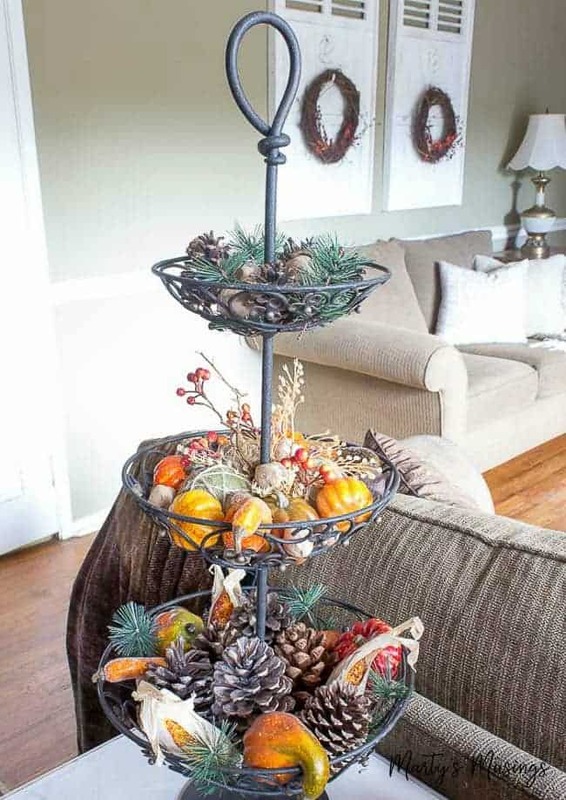 This 3-tiered stand is perfect for any season and here I mixed in both real and artificial pumpkins, gourds and greenery. 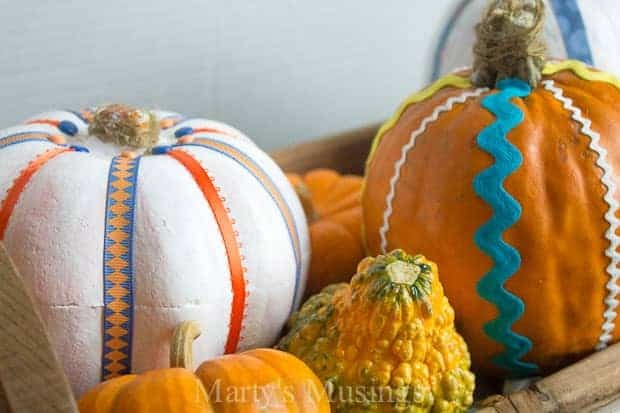 Are these pumpkins real or fake? 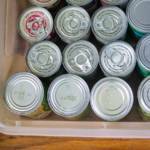 You’ll have to check out this oh so easy craft project to find out! 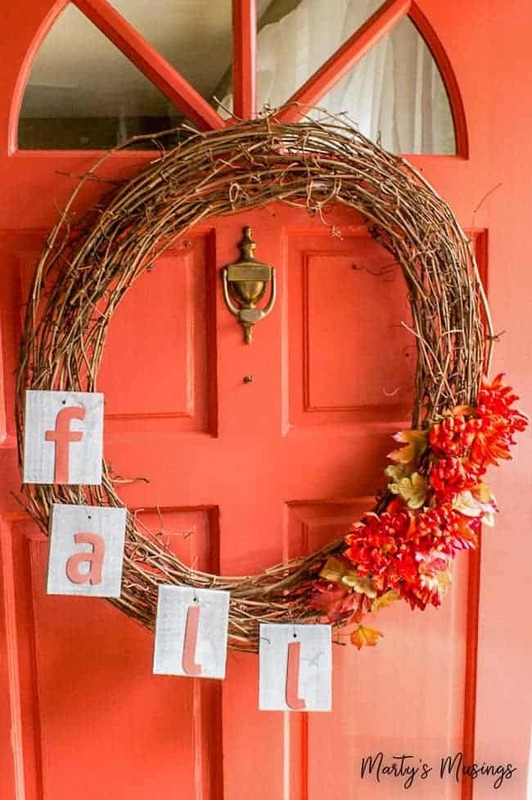 Burlap wreaths have been the rage for a while now but how about adding a couple of items from the dollar store for a brand new seasonal greeting for your front door? What could be easier and cheaper than going outside and bringing in free ingredients from nature? Whether that’s pinecones, branches, leaves, acorns or whatever is native to your area of the world, take a walk and discover the beauty that’s right outside your door! 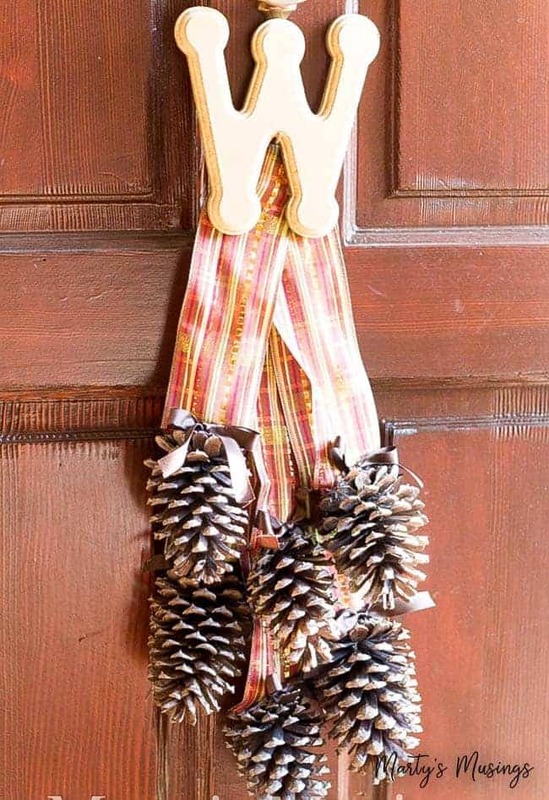 Most of the time we’re just limited by our imagination and this pinecone door hanger is an example of thinking outside the box. So simple but so unique! 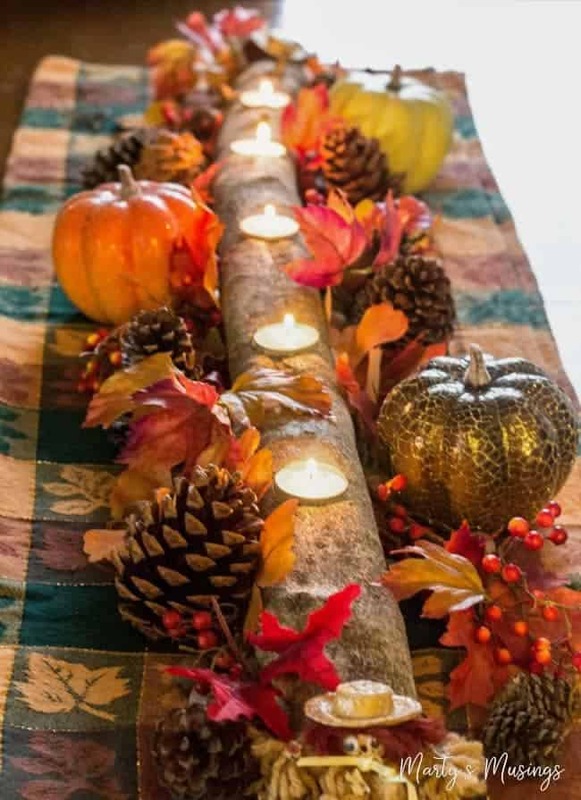 Still one of my favorite projects, this rustic log candle holder gets used for different seasons in my home. 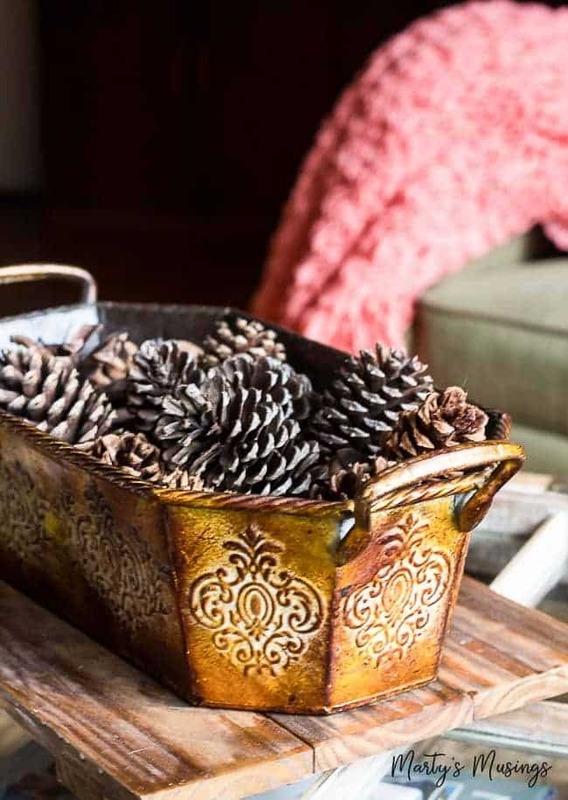 Whether it stands alone in a vignette or decorated as a centerpiece like below, it lends a rustic touch to the any season. Y’all know this is my favorite thing to do! 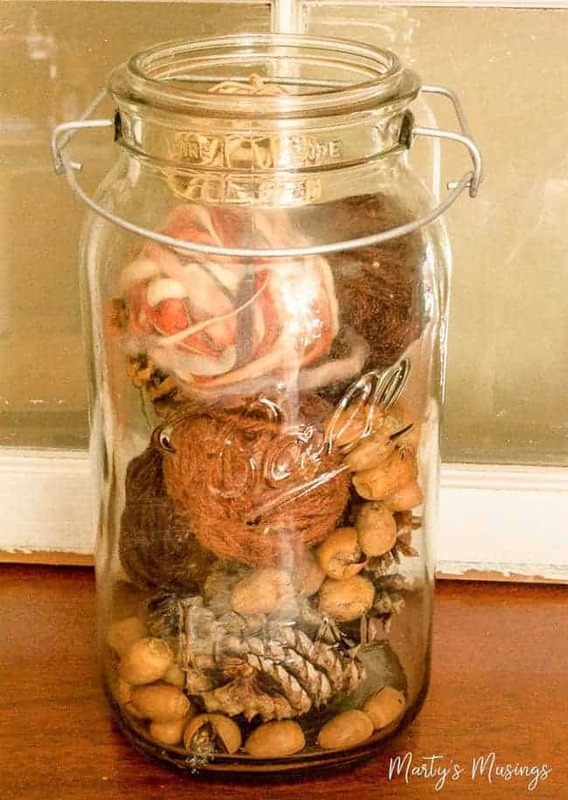 This large mason jar was a $1 yard sale find and is filled with balls of yarn, pine cones and acorns. 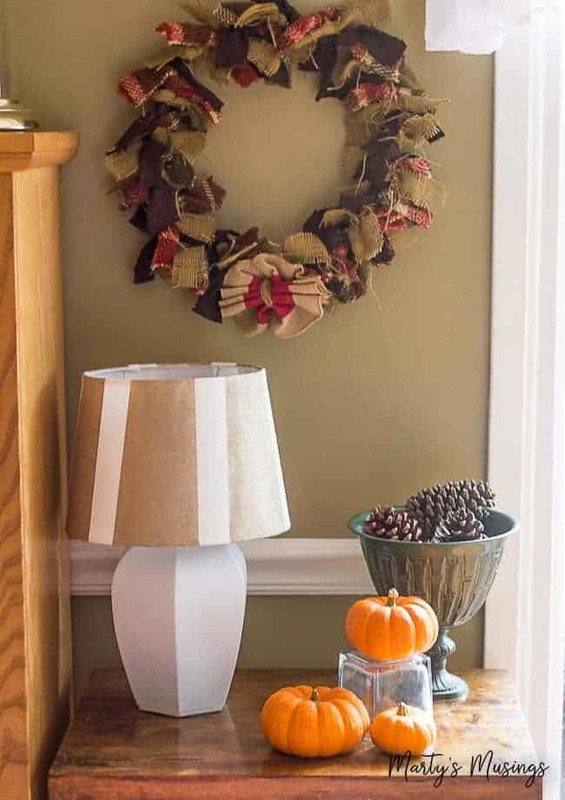 Here the oversized jar is used again as part of a fall vignette. So simple AND thrifty! Believe it or not, I found the flowers and grapevine wreath at a yard sale and put them together with these wooden blocks for an adorable front door arrangement. Although I’m not much of a wreath maker, I did create this fabric rag wreath with some old clothes, burlap and a wire coat hanger. Totally doable! It’s probably not possible to buy all your home decor and accessories without shopping at least a few “real” stores. But when you do, arm yourself with coupons and know when to buy! 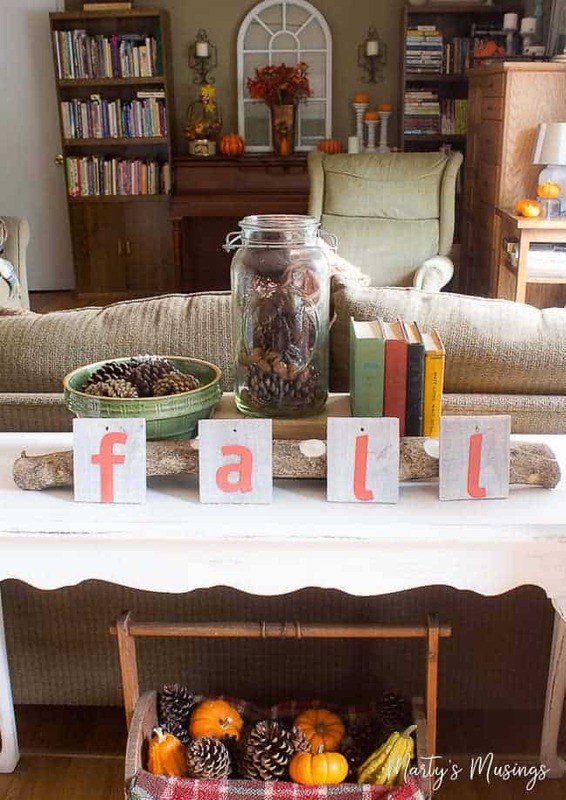 Most craft stores offer weekly coupons and carry a lot of seasonal decor items. Also purchase end of season items at drastically reduced prices and save for the following year. I like to mix in my own china with dollar store seasonal glasses or plates for a beautiful fall table. 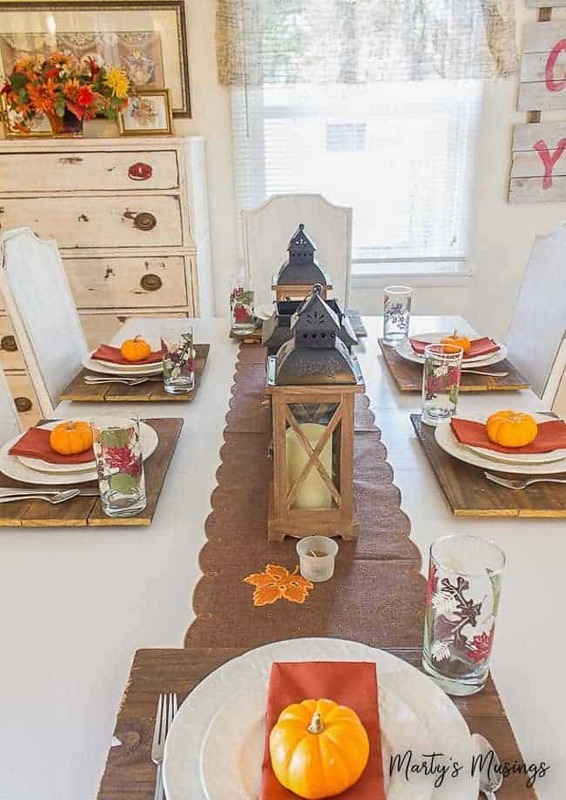 These inexpensive lanterns came from Big Lots and I use them everywhere in my home! I’m a gal who loves decorating for the seasons but somehow I’m discovering the gift of the “less is more” philosophy. Y’all, that little tip has been a long time coming for me. In the past I loved collecting everything from teapots, to miniature teasets, to my Christmas village display. But I’m here to tell you letting go of much of the “stuff” is freeing. Celebrating the seasons should bring us joy, not weigh us down with one more responsibility for the to do list. 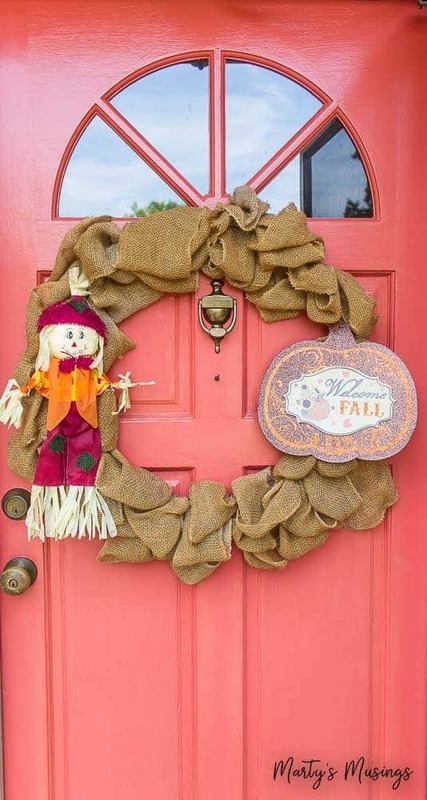 As you decide how to save money on fall decorating remember your time is valuable as well. I realize that not everyone has the time to implement all these strategies! To be helpful I searched for some alternative home decor “look alike’s” to help you with your shopping! Beautiful ideas and great insight! So hard not to compare ourselves to others when decorating our homes but instead to be thankful and blessed with what we have is so freeing! Thank you again for sharing not only your great ideas but your heart as well. Your blog is such an inspiration to me! Hi, Mitra. Thanks so much for the encouragement. 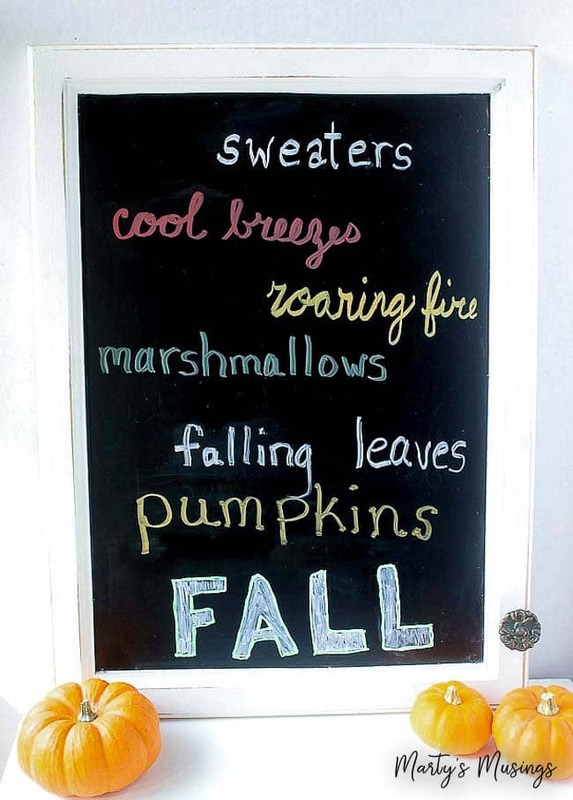 I have to remember to take my own words to heart as I’ve been sick and haven’t decorated one single space for fall! Hope you’re doing well, friend! Marty, thanks so much for “keeping it real”. I thoroughly enjoy reading your blog and finding new ways to repurpose/reuse and thinking outside of the box. 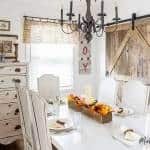 I subscribe to many blogs, all of which I enjoy, for me it is especially the tablescaping ideas, but I often find that the decoration and dishes used for each new season are very costly to purchase and then you have to have the space to store anything out of season. 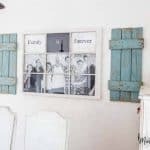 I find I can easily relate to your blog/ideas as there are so many of us who live in what may not be a large home but regardless is a very much loved home and this you can see if every post you do! Keep up the great work and stay safe as Hurricane Florence moves in closer to you. Hi, Kathryn! Thanks so much for the encouragement. I’m so glad you found some new inspiration. I definitely can relate to needing to use the space you have and the things you already own. Learning to love the home you’ve been given and practice contentment is such a part of the fabric of my heart. Thanks for the well wishes with the hurricane. We came out unscathed and we’re so grateful! Our neighbors to the east didn’t fare so well. Blessings to you! No fall stuff this year and much less Christmas stuff last year but focus was on people not stuff. The decorations of past years is happily stored in plastic containers in the basement! Maybe some day but not now. Since my stroke I can’t get to the basement to carry upstairs all the stuff. Poor husband spends much of his day taking care of me. I am so blessed and thankful for him that I don’t want him to have to decorate for me and take him away from devotional time and reading books of our heritage of spiritual giants. I love your honest and encouraging blogs. Hi, Kathie. I’m so sorry for your stroke, but you have the right attitude. Focusing on people and not the stuff is how we should be, regardless of our health. What a wonderful husband you have! Thanks so much for reading and I’m so glad it’s an encouragement for you! 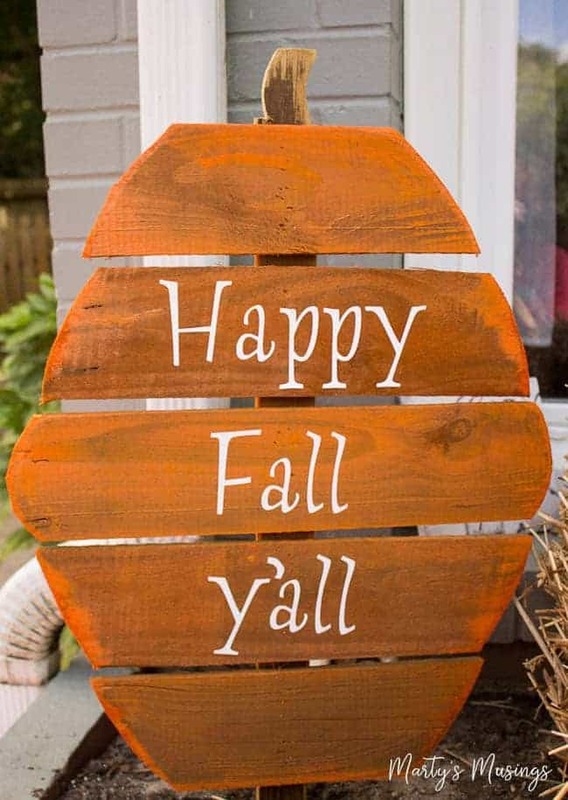 I love that fall Ya’ll pumpkin sign. I’m going to work on that tomorrow. Thanks Marty, great ideas. Hi, Diana. Good to hear from you! The pumpkin sign is still one of my favorites as well! Hope it turns out well for you and brings you joy!